The 34th occurrence (since 1950) of the 50-day moving average of the S&P 500 crossing its 200-day moving average to the downside is imminent. With the S&P 500 closing at 2,700.07 on 12/4/2018 the Death Cross is expected, with high probability, on Friday December 7. Will the arrest of Huawei’s chief financial officer drive the S&P 500 below 2602 today for an earlier Death Cross? The looming Death Cross could indicate the potential for a major selloff. 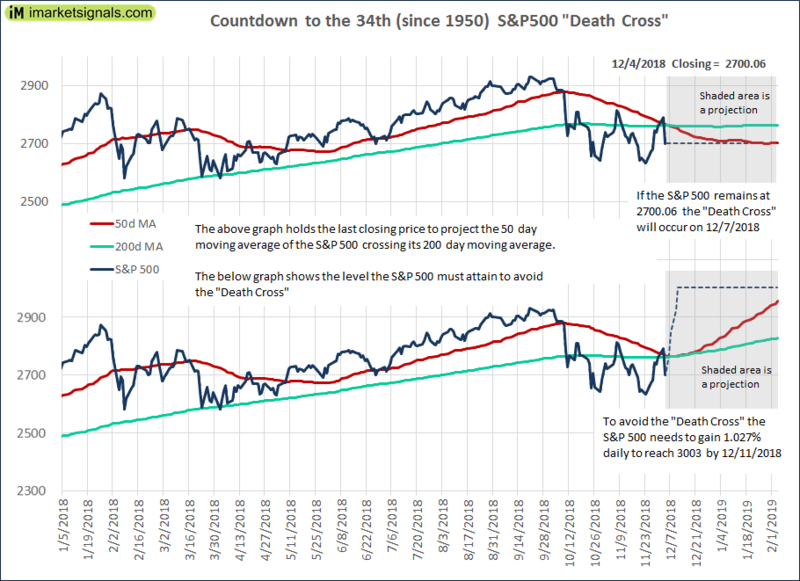 In our article The S&P 500 Death Cross – Time To Panic?, we analyzed the markets after a Death Cross, that is when the 50-day moving average of the S&P 500 crosses its 200-day moving average. We now face the 34th Death Cross in the first or second week of December. We warned since Friday 11/23 of an early December looming Death Cross. After Tuesday’s sell off, and the S&P 500 loosing 3.25% on the day, and now at the time of writing with futures pointing downward after the arrest of Huawei’s chief financial officer, the Death Cross will be avoided today if the S&P 500 closes above 2602, otherwise it will happen on Friday December 7. The future simulated S&P 500 remains at the 12/4 close of 2,700.07 for the coming days. Then, the Death Cross is on Friday, December 7. The future simulated S&P 500 gains 1.027% on its previous day to close at 3003 on December 11. The Death Cross would then be avoided with the difference of 50-day and 200-day moving average equal to zero on that day, a highly unlikely scenario..
Based on past history of the performance of the S&P 500, there is no need to panic. A Death Cross does not always result in major market losses, as can be seen from the analysis. However, it would appear that one should avoid being invested in the stock market during the first two months after a DC, as there were many losses during this period, whereas the historic maximum gain was only about 13% in this period after any of the 32 DCs. It is prudent for asset allocation to be in accordance with prevailing market conditions. More aggressive investments can be used during up-market periods, while more conservative investments are applicable during down-market periods. It would appear that good market timing models, such as our Composite Market Timer could provide guidance after Death Cross events. Friday will be Dec 7th, not 6th. There is another “death cross” that is soon going to happen, which is the S&P going below the value it was exactly one year prior. This is also pretty infrequent and works as a similar predictor to the moving averages. I think we need an “Enhanced MAC-US”, a MAC-US without all the false signals. My thinking is, death crosses are noise without something fundamental to back it up. For example, I suggest that we only heed the MAC-US sell signals if, 2s10s has inverted, ANFCI turned positive recently, Ted spread spiked above ~1.2, Google Trends “Recession” interest spikes, forward earnings growth is negative, etc. All Timing Models or Indicators which are still in the market and have not given a clear SELL by now have proven to be of no value.